You Can Run a Marathon! : DHL Stafet! 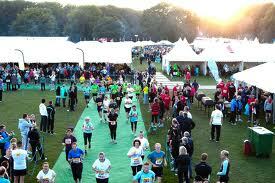 I haven't written for awhile but am still running :-) I've just been busy with my new job and running coach studies! 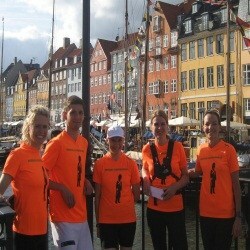 On Thursday the Running Copenhagen team ran the Dhl Stafet. This is a very big event which is run over 5 days in Copenhagen and is also run in different towns in Denmark before the Copenhagen week. You run in a team of 5 runners from your work. 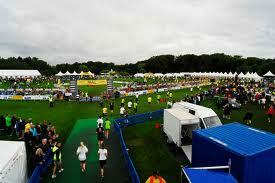 This is the biggest team relay event of its kind in the world!! Anyway we were missing a runner so I was going to run first and then fourth or fifth. I got to where I thought the start was but then realised it was still another 5 minutes away and I had only 2 minutes to get there. 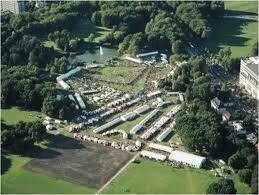 After a little pushing past people (well there are around 26000 people there each day, and the zeros are correct!) I made it to my start position just as the gun was fired. I think I went with the wrong people though and should have started 30 seconds later....opps! I was having a great run! At 4k we had to run on a green carpet thing on the grass and this made the going very spongy which in turn was making my ankles twist around. At 5k I run up to where the next person in my team was waiting and passed the baton over while cheering them on. I then went back to the Running Copenhagen tent and managed to talk one of the other guides, Flemming, into running twice so I didn't have to. I was a little worried about hurting my ankles when I got to the 4k mark again. And so we all ate and drunk wine and champagne untl it got too dark! Our joint team time for the full 25k relay race was 1hour and 59 seconds which is a pretty great time I think!